A HIGHLAND Perthshire golf club has hooked-up with Perth’s award-winning Noah’s Ark Golf Centre. 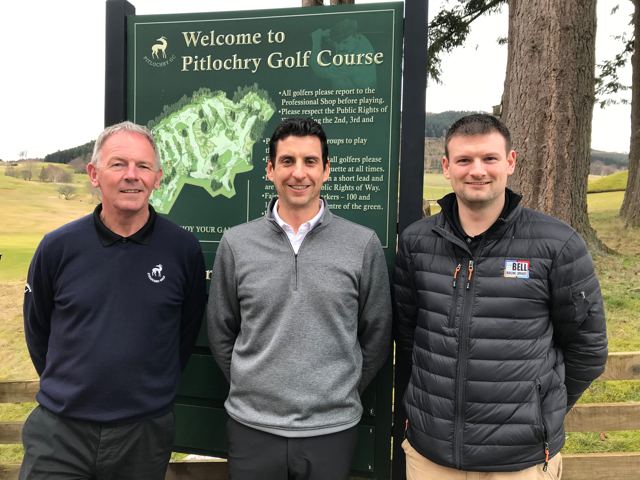 Pitlochry Golf Club, which dates back to 1909, has struck a deal with Niall McGill’s team to handle the full gamut of professional golf services for members and visitors to the picturesque course in the shadow of Ben Vrackie. Niall was hailed the Foremost Golf Professional of the Year 2017 and he has played an integral role in reviving the fortunes of Perth’s historic North Inch municipal course. “It’s a great opportunity for the club, Pitlochry Golf and ourselves to adopt a collaborative approach,” he said. “We will be offering everything from club, buggy and trolley hire to coaching from our team of qualified professionals. We will be working closely with Pitlochry Golf to grow and develop golf in the area, making full use of practice facilities which are among the best in the region,” he said. “The club secured Sport Scotland and Perth and Kinross Council funding a few years ago and it is an amazing set-up. Every club would want facilities like there are here. “The course itself is stunning and regularly features on lists of Scotland’s hidden gems. A leading American golf travel writer recently described Pitlochry as ‘the best golf course in the world under 6000 yards.’ Reviews like that should ensure it is less hidden! “We will be setting-up a family day in May with the emphasis on mums and the kids, and working with the club’s volunteer coaches. “We will be supporting the successful Scottish Golf ‘Get Into Golf’ programme and looking to encourage newcomers and also helping returning adults back into the game. “There is a great opportunity for expanding the visitor golf market, given that Pitlochry is a popular tourist destination. “When I was a young pro in Portugal residential schools were very popular and I see scope for that here. Surveys show that golf has an ageing profile but Niall insists: “That can be a positive, rather than a negative. “People are living longer and golf is one of very few sports you can play long after retirement. “The average age of a golf club member is their early sixties. This age group has disposable income and time on their hands. We see this as a growing market - and at 60 or 65 you should have many years of golf in you. “So we are going to introduce a Seniors’ Beginners programme in tandem with members. There will be PGA instruction but also a buddy-type set-up to encourage participation and grow membership. “Obviously we want to encourage youngsters and families into the game. But there is also scope for attracting an older group back into golf, maybe ex-footballers or hockey players no longer playing such an intensive sport. “We will also be encouraging greater female participation. On the continent the percentages of those playing golf are 60/40 male/female.